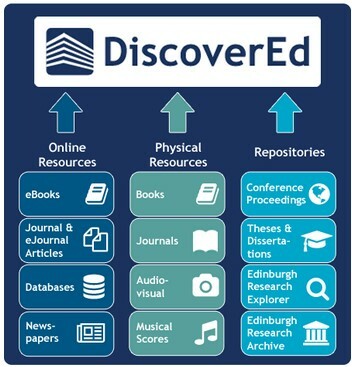 DiscoverEd is the Library’s discovery service; use it to search the Library’s collections, including books, e-books, journal titles, journal articles, and databases. If you can’t find a book you need for your studies, you can use the Request a Book form and the Library will try to buy it. However, it can take a few weeks for a book to arrive; if you need something quickly, you might want to submit an interlibrary loan request instead. You can use the ILL service to borrow material not held by Edinburgh University Library. Most things can be requested: books, articles, reports, conference proceedings, patents, standards as well as other materials. All staff and students have a quota of free requests per academic year (5 for undergraduates, 30 for postgraduates and staff) and straightforward requests from widely-available books or major journals can arrive within a few days, but more obscure items can take longer, so don’t leave your request to the last minute! But how do I find what isn’t in the Library…? Many ‘extra’ resources will come from the bibliographies of the books and journal articles on your resource list; you’ll come across an interesting title and want to investigate further. However, you can also use other discovery services such as WorldCat, which searches the collections of over 10,000 libraries around the world. You can also contact your Academic Support Librarian, who will be able to help you with things like literature searching and explain more about all the different services the Library offers. This entry was posted in Uncategorized on March 23, 2018 by Louise Dutnell.